Review: "Banks, Peter: Be Well, Be Safe, Be Lucky : The Anthology" - Sea of Tranquility - The Web Destination for Progressive Music! The list of musicians who can say they were once a part of Yes really is quite extensive. Few however can say they were right there at the start. Guitarist Peter Banks could lay claim to that accolade and also to being the six string presence on the wonderful Yes album and Time And A Word. Banks would also form Flash, have a stint in Mabel Greer’s Toyshop prior to Yes and record a selection of solo albums, but sadly the guitarist died in 2013 aged only 65 after suffering from heart problems. At best Banks’ solo career was sporadic and I must admit that until now I hadn’t actually heard any of the man’s work outside of the aforementioned bands. Releasing Two Sides Of Peter Banks in 1973, some three years after his departure from Yes, it would be a further 21 years before a second solo offering would appear. Instinct was released in 1994 and was quickly followed by Self Contained in ‘95. Obviously getting a taste for the solo life, Reduction arrived in 1997 and all four albums are plundered for the first disc of Be Well, Be Safe, Be Lucky, which is subtitled The Best Of Peter Banks and also includes “Small Beginnings (Flashback Version)”, which was released on CD alongside the Beyond And Before autobiography. Peter’s final solo release Can I Play You Something?, which combined solo work with material originally written for Yes, Mabel Greer’s Toyshop and Banks’ other bands, The Syn and The Devil’s Disciples, was released in 1999 and eight of its fifteen tracks appear on disc two, Can I Play You Something More?. Alongside them are “Small Beginnings (Epic Flashback Version)” also from Beyond And Before, two tracks from the Guitar Workshop II project, “Astral Traveller” from the Tales Of Yesteryear release and three previously unreleased tracks, “Endless Journey”, “As Night Falls… And Continues...” and “Knights (revisited)”. The latter of which was completed by Billy Sherwood and Jay Schellen after Banks’ death. So in a way there’s something for everyone here, newcomers like myself able to be surprised by how ‘current’ Banks’ sound was on his return to the scene, a surprisingly fiery fret attack at times akin to Steve Vai. While the quirky undertones that often appeared (such as referencing songs by other bands and composers fleetingly within his own) lend a truly individual tone to proceedings. Mix that in with the vintage poise you might more readily expect and the ability to change mood and approach at will and the variety on show is one of the main features here. The unreleased moments however will doubtless have hardened fans queueing up to see what’s in store. “Endless Journey” an ambient slide of atmosphere and mood, “As Night Falls… And Continues...”similarly abstract until its closing sections where a tasteful stretch of guitar is revealed, while “Knights (Revisited)” is a more pushy, one minute twenty of cagey beats and off kilter melodies that remind gently of King Crimson. In truth, as a newcomer to all of this material, I’ve found the jumping between styles to feel a little disjointed, but considering that these tracks were never intended to be brought together over two discs in the first place, it’s maybe a harsh observation. Still, this collection does make an interesting, eclectic and varied starting point for anyone looking to become acquainted with the works of Peter Banks. While the rarer output mixed with the material intended for other projects on disc two offers a welcome insight to another side of this much missed guitarist. Personally however, I’ve found the three album set, The Self-Contained Trilogy, released simultaneously and featuring Instinct, Self-Contained and Reduction, to be a more rewarding experience. DISC TWO: CAN I PLAY YOU SOMETHING MORE? 1. CAN I PLAY YOU SOMETHING? 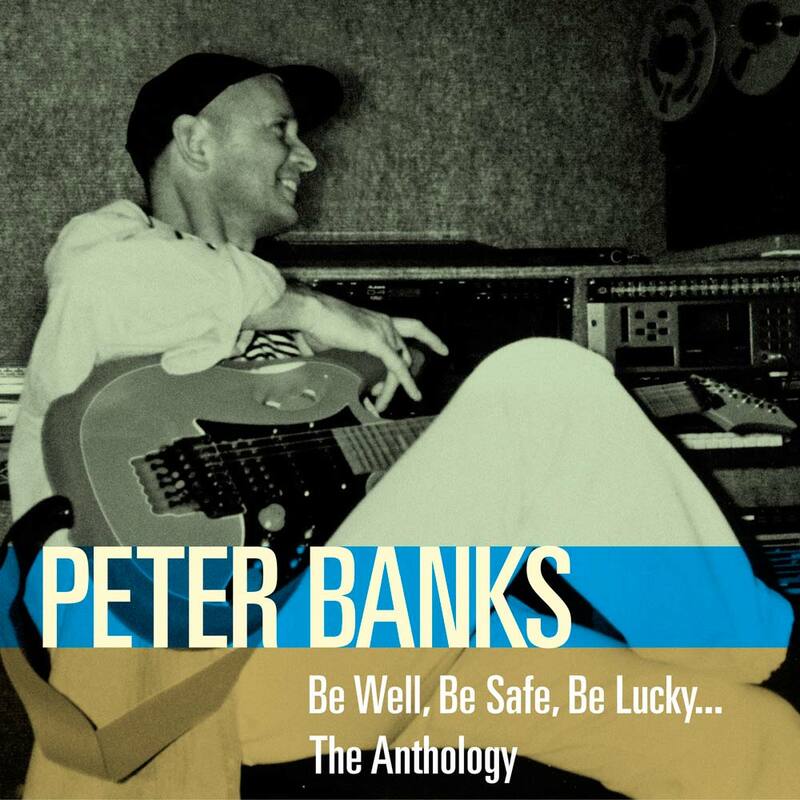 Good to see a little Peter Banks love at the moment with the simultaneous release of both Be Well, Be Safe, Be Luck: The Anthology and The Self Contained Trilogy, giving everyone basically all they will need of the former Yes guitarists solo material. This 2CD compilation here draws material from the latter, along with additional rarities, and might be a good place to start for those looking to investigate some of Banks' work outside of Yes or Flash. The first disc features an assortment of tracks from the Instinct, Self-Contained, and Reduction albums, all originally released between 1994-1997. These instrumental tracks feature a wide selection of musical styles, from the rocking guitar workouts like "All Points South", "Knights", and "The Age of Distortion", to the more delicate fare like "Fade to Blue" and "Fogbound", Banks crossing into prog, guitar shred, folk, World Music, and classical with ease. Based on what information is NOT given in the booklet, much of the drum, bass, and synth work seems programmed to work alongside Banks' guitar, and when a guest musician is employed on the track that is noted. Steve Hackett, John Wetton, and Phil Collins show up on "Knights (Reprise)", but at barely over 2-minutes long, it's a brief, unrealized jam that doesn't quite live up to expectations and leaves you wanting more. Dance beats mix with fiery lead guitar on "Massive Trouser Clearance", a quirky and fun piece that really provides a great example of where Banks' musical head was at the time. Over on disc 2 is where things get a little bizarre, as this set culls tracks from all over the place, such as the Can I Play You Something release, Guitar Workshop II, as well as a grab bag of previously unreleased and rare recordings. Not a ton to recommend here, but it's worth the price of admission alone for the crazy guitar explosions on "Warning: Rumble Strips, the jazz fusion of "Dancing Angel" (makes you wonder how Banks would have worked in a '70s styled fusion band), his reworking of Yes' "Astral Traveller", and the near 20-minute "Small Beginnings (Epic Flashback Version)", which is a great homage to his former, much underrated band Flash. Hit or miss in spots but still with plenty to recommend, this anthology demonstrates the talents of Peter Banks, a truly remarkable guitar player who left us way too soon.